Living Edens: Temple of the Tigers explores how one of the subcontinent’s most magnificent and endangered animals fulfills its destiny in a remote nature preserve that also shrouds the ruins of a long-fallen empire. Hinduism, the dominant religion of India, views all living creatures as moving on the same wheel of fate. Karma determines each one’s destiny, and a trinity of gods representing the cycles of creation, preservation, and destruction oversees the universe. 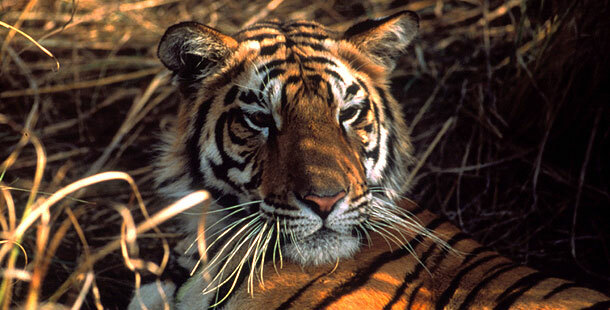 The filmmakers transport viewers to the Bandhavgarh plateau rising from the jungles of central India. Once the capital of a powerful dynasty of maharajas, it is now the protected domain of the royal Bengal tiger and other indigenous wildlife. The city’s palace and temple ruins are also the solitary retreat of an old Hindu priest, who tends the shrines and awaits the annual pilgrimage made by thousands of the devout who come to pray at these ancient places of worship. Sarah Birnbaum is an educational Web producer in New York.